The texture is very polished and very creamy. Impressive melt qualities with a great mouth feel. Initial notes are earthy with and tobacco. Dried black fig. No bitter which is surprising for the deep dark qualities. There is no over roasted taste, which is nice, the chocolate flavor is able to shine. Black tea with tannins, nice sophisticated gentle tannins similar to those in a more expensive golden tips sort of tea, comes through on the mid palate. There is a very small little tiny bit of tart, like the sour and tart qualities of a kumquat, lurking in there somewhere. It is pretty quiet so you have to watch for it. She finishes with a touch of black pepper then sour notes that remind me of the finish on many fine bourbons. Those sit at the top back of your throat for quite a while then eventually the fig and tobacco resurface. Long complex finish on this one, don't palate cleanse too soon. LetterPress Chocolate is new to the game so you might not have heard of them quite yet. They were gracious to send me prototype samples (I love prototypes!!). I'm impressed with the quality for such a young company. The chocolate is complex and they have nailed texture, which is one of the most difficult things to manage for a young company. 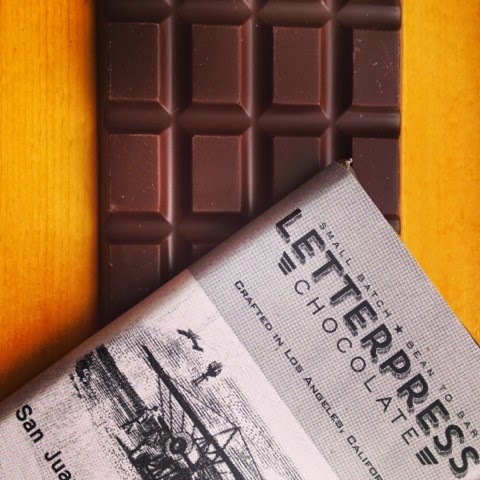 LetterPress Chocolate uses just two ingredients: cacao and sugar. From Los Angeles CA, yet traveling to cacao farms and getting involved in cultivation to help farmers and small co-ops this is a company that is already on the right track and I'm going to have great fun watching as they grow. ***Another tasting...Ive been tasting this bar for just over a week and it continues to befuddle me. In recent tastings I definitely taste roast, a heavy roast, along with some bitter notes. In addition, I now get a rubber band scent and slight flavor. You might think rubber band is a bad scent or flavor, it really isn't. Kind of reminds you of elementary school days in a good way. Was it the way I stored the bar or did I miss these notes before due to allergies (this season is hitting us pretty hard with tree pollen)? I'm not sure but I'll be sure to find another bar once they are released to compare.